Honda has always assigned grandiose names to its in-design Civics (such as "Wonder Civic" and "Miracle Civic"), with the latest car drawing the nickname "Epic." That's a tough adjective to live up to, but the 2016 Civic (mostly) does. 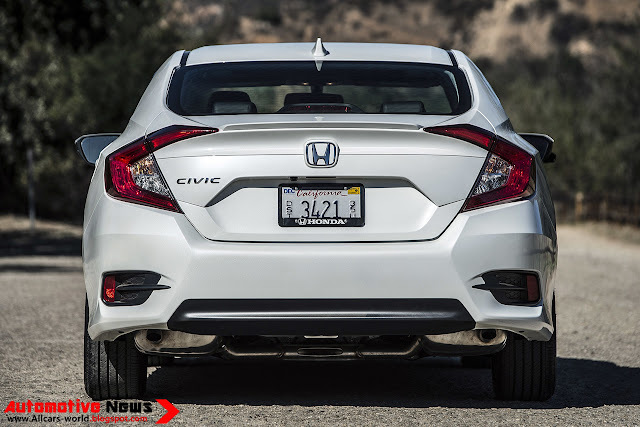 Based on an all-new platform, the 2016 Civic is longer, wider and sleeker than the model it replaces. The Civic's wheelbase is up by 1.2-inches, netting an extra 2.2-inches of rear seat legroom. Meanwhile, the Civic's front overhang has been reduced by 1.2-inches while rear overhang has grown by 3.0-inches, allowing for a more flowing roofline and bigger trunk. The Civic's roofline has come down by 0.8-inches while the the hood and cowl are down by 1.6-inches, adding to the car's sporty look. The 2016 Civic uses a mixture of high- and ultra high-strength steel for most of its chassis components, yielding a stronger frame that is about 68 pounds lighter than the unit it replaces. That strong base is important because to it Honda bolted a sportier suspension and better brakes. 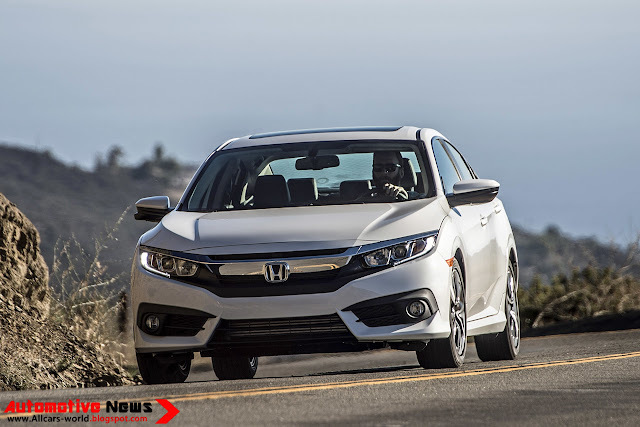 The new model year ushers in a new DOHC i-VTEC 2.0L four-cylinder engine that now stands as the Civic's base motor. It produces 158 horsepower at 6,500 rpm and 138 lb-ft of torque at 4,200 rpm. It can be had with a six-speed manual or a Continuously Variable Transmission (CVT). Optional on mid-level cars and standard on the upper end of the Civic range is a new 1.5L turbocharged four-cylinder. 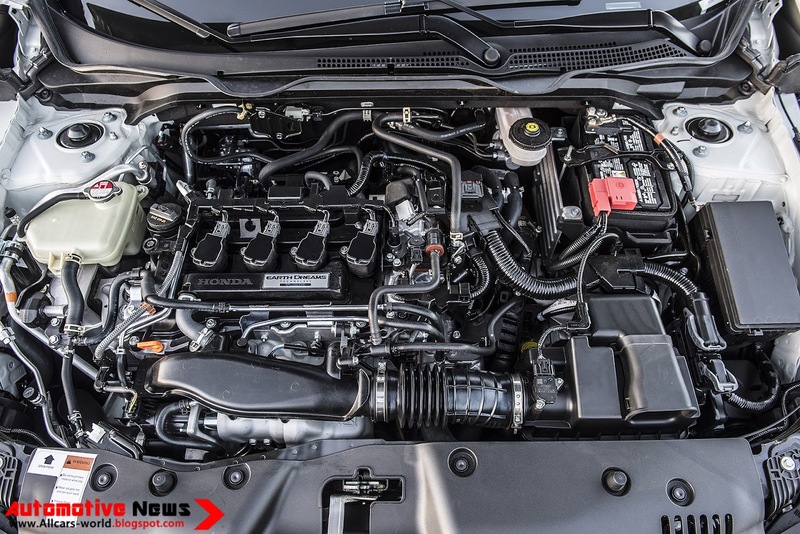 Thanks to its turbo, Honda says the 1.5L makes the equivalent power of a 2.4L naturally aspired four-cylinder -- 174 horsepower and 162 lb-ft of torque to be exact. It's currently only available with a CVT, but we're told that Honda has plans to eventually offer the turbo engine with an enthusiast-approved six-speed manual gearbox. Fuel economy is very good for either engine option. The 2.0L is set to return 31/41/35 mpg city/highway/combined while the more powerful 1.5L will return 31/42/35 city/highway/combined. Honda wrapped all that new hardware in fresh sheetmetal that is far more stylish and upscale-looking than the last Civic. 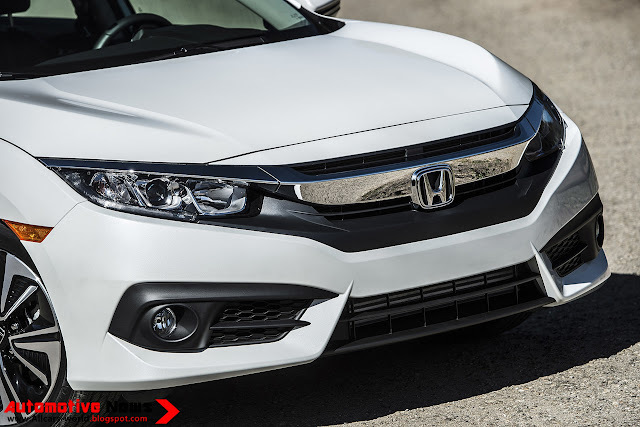 The front of the Civic is inspired by the 2016 Accord and includes a new chrome grille bar that extends above the car's wide and thin headlights. Though admittedly on the bling-y side, the chrome design element at least give the Civic a face to remember. Top-spec cars like our Touring model include LED headlights that look similar to the headlight treatment given to modern Acura vehicles. Mid- and upper-level cars also receive fog lights integrated into an aggressive-looking lower bumper. 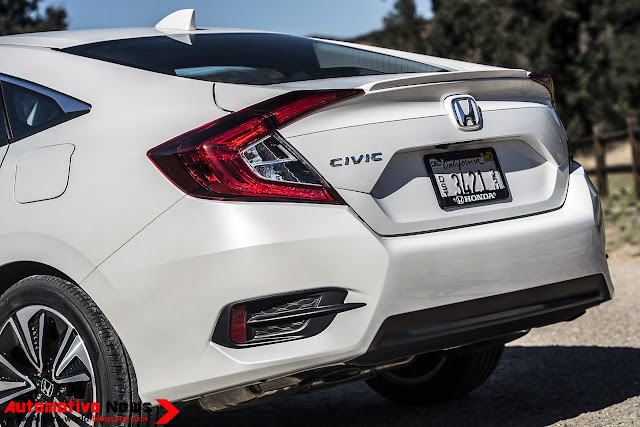 Move farther back and you'll find flared wheel arches and a distinctive crease along the lower portion of the doors, giving the Civic a decidedly muscular look. The black-and-silver five-spokes on our tester wouldn't be our first wheel choice, but they at least fit with the Civic's funky and youthful vibe. The rear three-quarters is probably the Civic's best angle, giving you the opportunity to soak in its fastback-like roof line and boomerang-shaped rear lights. With the new Civic, we can see what Honda was going for -- but missed -- with the Crosstour. As far as styling goes, this next-gen Civic stands out. The lines are sharp and deep, cutting through the bodywork front to back. The headlights are narrow, bookending a strong central grille blade that pushes into the front fenders. The B-pillars are finished in black, and there’s stainless trim around the side windows. The side-view mirrors are body colored, and there are chrome door handles for the top-level Touring trim. The profile is punctuated by a recess just above the side skirts, which is angled in such a way as to emphasize the sportback roofline. The rear looks large and chunky, with further styling elements in the bottom corners, plus dual exhaust tips (a Civic first) for the EX-T trim level and above. Blend in with the crowd, this Civic does not, and love it or hate it, you gotta hand it to Honda for at least taking a chance with the next-gen Civic’s styling. 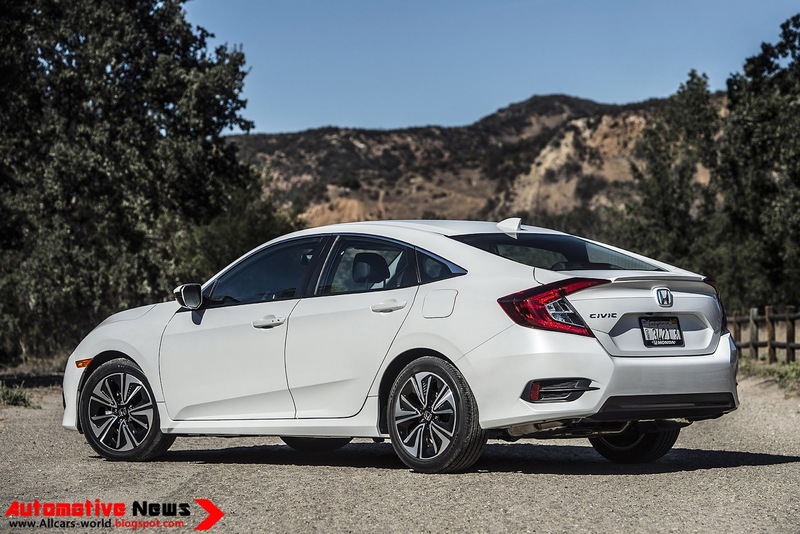 While striking to look at, the new body panels also complement full underbody covers (a Civic first) for a 12-percent improvement in aero efficiency, making for the most aerodynamic Civic in the model’s history. Not only does this translate into higher fuel economy, but it adds up to a quieter cabin as well. Coinciding with the new look, the exterior dimensions are altered. The sedan’s wheelbase is now 1.2 inches longer, with overall length increased by 2.9 inches, giving more room inside. The front overhang is now shorter, which helps the aero, while the rear overhang is longer for more storage. The sedan is also nearly two inches wider, gaining 1.9 inches in the front track and 1.6 inches in the rear track, plus it’s lower, losing 0.8 inch in height. Sizing, styling, and material composition for the wheels vary, and include 16-inch steel units with full covers for the base-model LX, 16-inch alloys on the EX, and 17-inch alloys for the EX-T, EX-L, and Touring. Every wheel option comes wrapped in all-season tires. Like the new exterior, each wheel design is unabashedly unorthodox. They’re all a little too busy for my taste, but I’m prone to throw on a set of aftermarket wheels regardless of what comes from the factory. Every 2016 Civic model comes with standard LED daytime running lights and C-shaped LED taillights. There are also optional LEDs for the headlights and amber turn signals. Customers can choose between nine exterior paint options, four of which are new – Aegean Blue Metallic (new), Burgundy Night Pearl (new), Cosmic Blue Metallic (new), Crystal Black Pearl, Luna Silver Metallic (new), Modern Steel Metallic, Rallye Red, Taffeta White, and White Orchid Pearl. The 2016 Civic sedan is about 3 inches longer and 2 inches wider than its predecessor, and its wheelbase is a bit longer, too. That means there should be more room for passengers, and indeed, Honda says the Civic has the most spacious interior in this class. Real-world testing sometimes calls bold claims like these into question, but make no mistake, this Civic is seriously roomy. 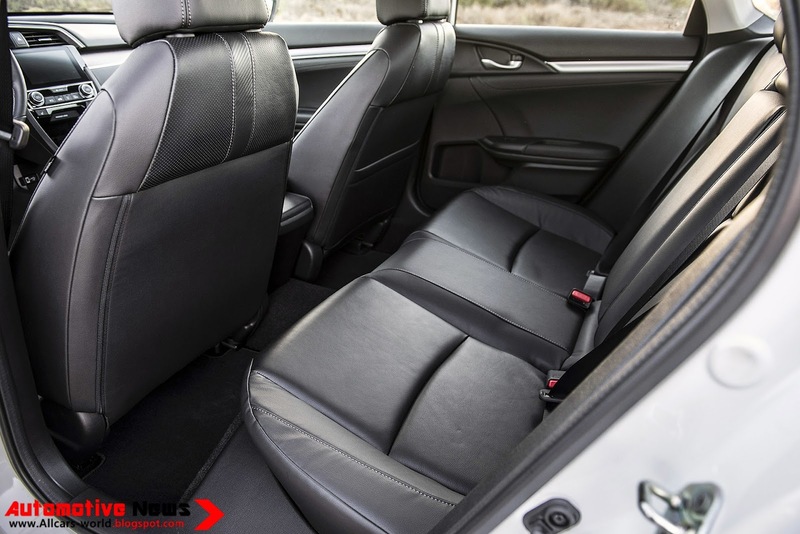 Even in the coupe, four 6-footers should be content to ride all day, which is an extraordinary achievement for a vehicle in this class, and that enhanced space should also be a boon to families using bulky child safety seats. From the driver's vantage point, the new Civic feels like a luxury car compared to the outgoing model. Gone is the busy two-tiered dash, replaced by an elegantly restrained layout with upscale materials for the segment. Thoughtful touches abound, such as a capacitive-touch volume button on the steering wheel that works well whether you slide your thumb across its ribs or click either end like a rocker switch. A 7-inch touchscreen comes standard in all trims but the base LX, and it includes both Apple CarPlay and Android Auto for full-fledged smartphone functionality via the touchscreen itself. Unfortunately, its slow response times, small buttons and confusing menu structure often make it frustrating to use. In terms of storage, there's an unusually deep storage bin under the center console's armrest with 7.2 liters of capacity -- enough, says Honda, for multiple iPads or a large water bottle. Trunk space, meanwhile, has shot up in the new Civic sedan, expanding from 12.5 cubic feet last year (an average figure) to a whopping 15.1 cubes. That's true family-sedan territory. Note that the Touring's trunk drops to 14.7 cubic feet due to the premium sound system's subwoofer. 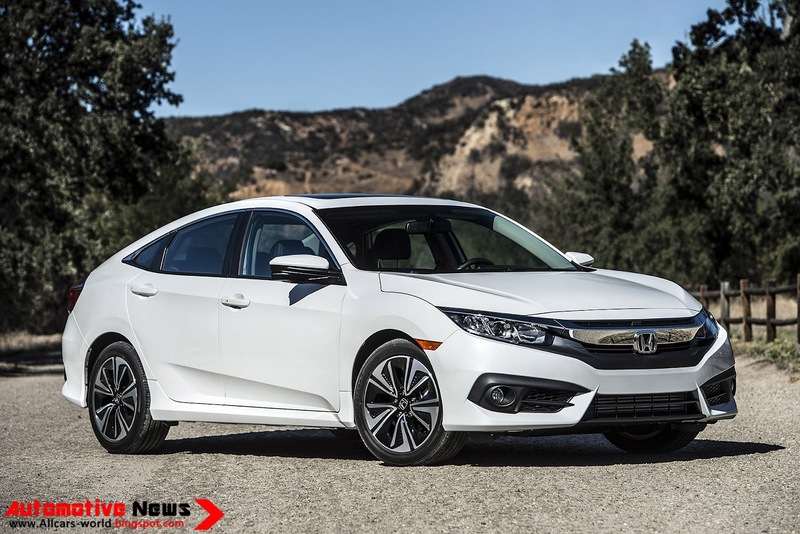 Honda's made sure to elevate the new Civic's list of standard and available features, given the progress among compact cars in general. All versions—even the base $19,475 Civic LX—now come with power windows, locks, and mirrors; automatic climate control; an electronic parking brake; automatic headlights; cruise control; LED taillights and LED daytime running lights; keyless entry; Bluetooth; a four-speaker, 160-watt sound system with a 5.0-inch LCD color display; and a 1.0-watt USB port that can charge smartphones. 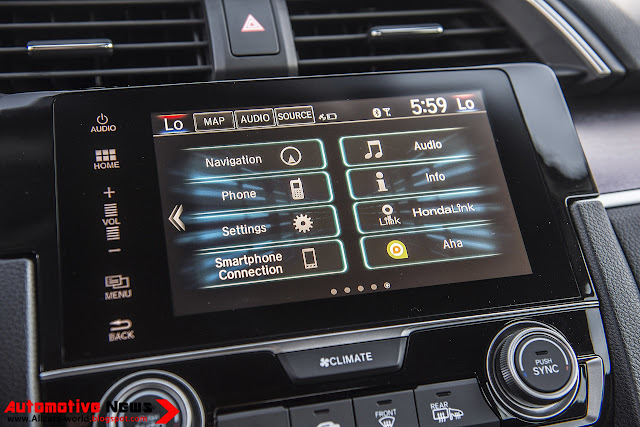 Upgrading to the $21,875 EX, the Civic adds a split-fold rear seat; heated mirrors; remote start; a sideview camera that shows the right-side view down the car when the turn signal is activated; a 7.0-inch touchscreen interface; a second USB port in the console; Apple CarPlay and Android Auto capability; an eight-speaker, 180-watt audio system; and keyless ignition. The 2016 Honda Civic is a compact car offered initially as a sedan, with coupe and hatchback styles to follow. The sedan is available in LX, EX, EX-T, EX-L and Touring trim levels. The coupe comes in LX, LX-P, EX-T, EX-L and Touring. The base LX comes standard with 16-inch steel wheels (alloys for coupe), automatic headlights, LED daytime running lights and taillights, full power accessories, cruise control, an expanded-view driver side mirror, automatic climate control, a tilt-and-telescoping steering wheel and manual front seats with driver height adjustment. Electronics features include a 5-inch central display screen, a rearview camera, Bluetooth (phone and audio) and a four-speaker sound system with a USB port and Pandora connectivity. LX-P coupes have this equipment plus a sunroof and keyless ignition and entry. The EX sedan adds those LX-P features plus 16-inch alloy wheels, heated side mirrors, variable intermittent wipers, a multifunction trip computer, a rear center armrest with cupholders, 60/40-split folding rear seatbacks, an eight-speaker audio system with dual USB ports, Honda's camera-based LaneWatch lane-change assistant, dynamic guidelines for the rearview camera and a 7-inch touchscreen interface with HondaLink smartphone integration, Apple CarPlay, Android Auto, SMS voice-to-text functionality and smartphone-app integration (including app-based navigation). The Touring adds different 17-inch wheels, LED headlights, automatic wipers, a four-way power passenger seat, heated rear seats (sedan), an integrated navigation system with voice controls and a 10-speaker audio system. 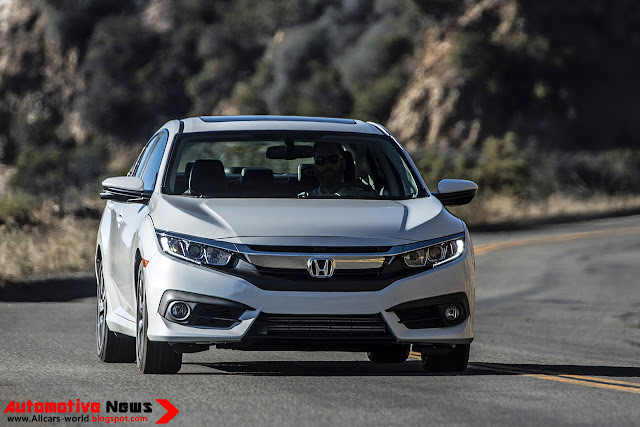 Also standard is a Honda Sensing safety package that includes adaptive cruise control, lane-departure warning, lane-departure intervention and forward-collision alert with automatic emergency braking. The Honda Sensing safety package is optional on all other Civic sedan trims, and it adds a basic trip computer to the LX. The navigation system is optional on EX-L sedan. 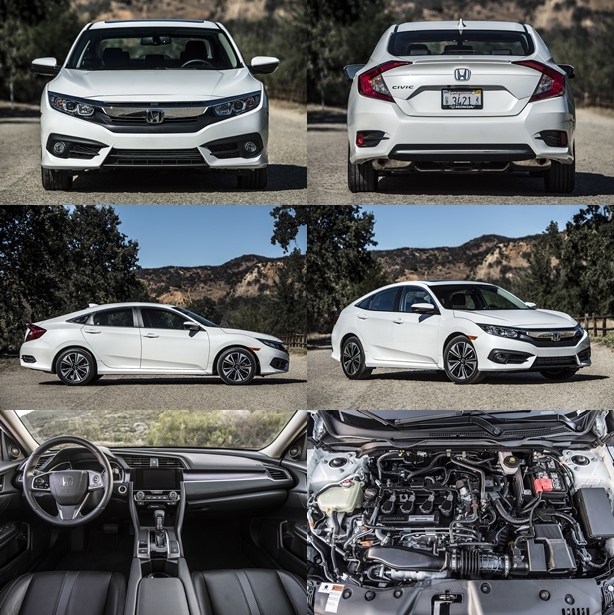 The base Civic gets its power from a new four-cylinder, a 2.0-liter unit rated at 158 horsepower and 138 pound-feet of torque. Available in LX or EX trim, it delivers its power to the front wheels through a 6-speed manual transmission or an available continuously variable transmission (CVT), which has been carried over from the last-generation Civic. Though it's a brand-new engine design, it feels familiar. Power output is similar to that delivered by a base Mazda 3 or Hyundai Elantra—it's more than adequate for commuter use, and it's delivered in an unobtrusive and unexciting way. The CVT in the base four-cylinder is carried over from last year's Civic, with just a wider span in its ratios. Nothing has changed the way it feels—CVTs use pulleys and a belt to provide an infinite number of transmission ratios, unlike the set gears of a conventional automatic. Accelerating via a CVT means wading through a slurry of gear-ratio changes, and usually brings with it lots of engine noise and an imprecise feel. 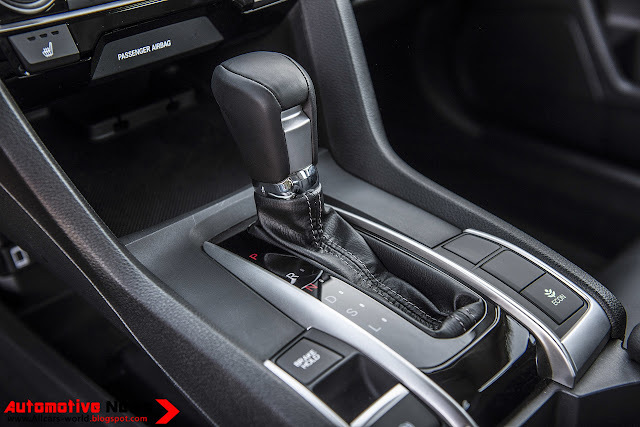 Honda's CVT seems to be a bit quicker and quieter at its job than some, but we've enjoyed driving some CVTs that come with paddle shift controls and a range of programmed set points that simulate automatic transmission gears. 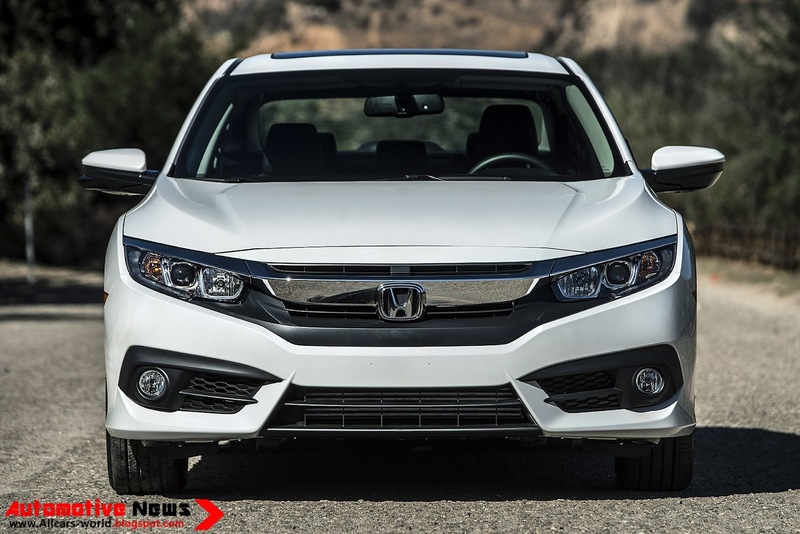 The Honda CVT has neither of those—at least, the sedan doesn't. In the end, the superlative 35-mpg combined EPA ratings are a worthwhile trade-off. The same ratings hold true for the far more exciting turbocharged four-cylinder, though, which makes the base four seem less a bargain. With a small-diameter turbocharger and an electrically-driven wastegate, the turbocharged 1.5-liter four pegs the performance meter at 174 hp and 162 lb-ft of torque—and with under 3,000 pounds to pull around, this Civic is more fleet-footed than ever. It sounds Honda-sweet at full blast, not as joyfully noisy as a classic VTEC-equipped engine, but still happy enough. 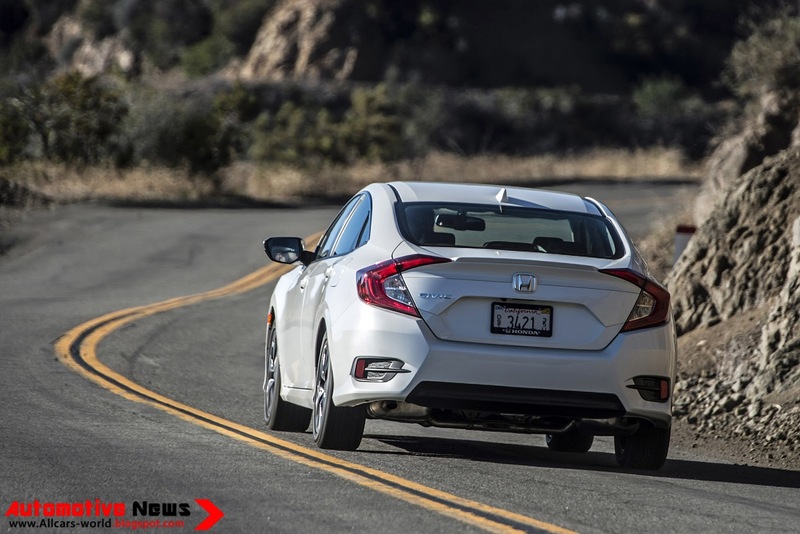 It's as quick as some Civic Si models from the recent past, too—but at lower speeds and in tight corners, it's a tug of war between the CVT's slower responses and the slight turbo lag of the new four-cylinder. The CVT responds to sharp throttle inputs in Sport mode, hanging on to revs, without dropping the fuel-economy ball—but to sip a little less fuel, Honda fits an Econ button that slows throttle progression and cuts the A/C's fan speed to trim fuel use slightly. The powertrains have their peaks and valleys, but in ride and handling, the Civic excels—especially beyond the prominent mid-range gap. No matter the metric--precision, stability, composure—it's a magnitude more mature than the last Civic. 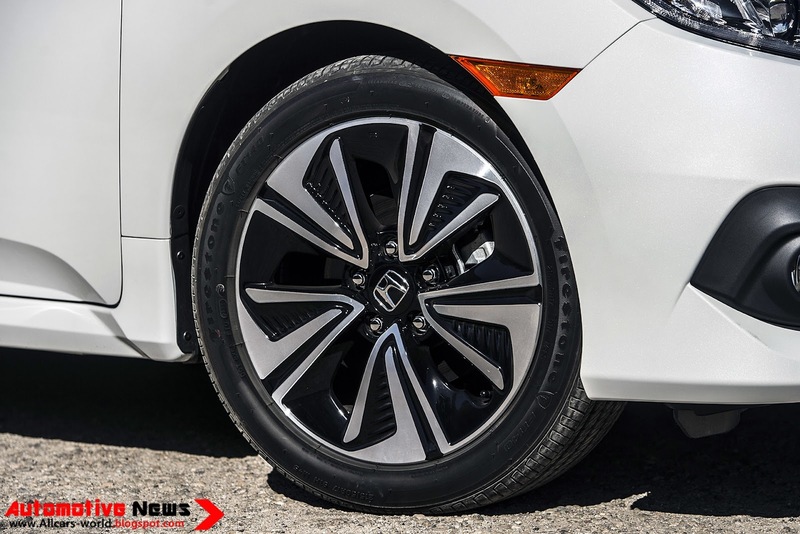 The 2016 Honda Civic comes standard with stability control, antilock disc brakes (many previous Civics came with rear drums), front side airbags, side curtain airbags and a rearview camera. 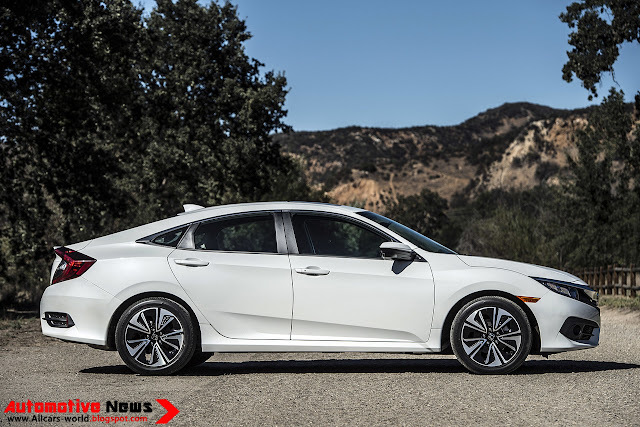 Starting with the EX sedan trim, a right-side blind spot camera (LaneWatch) is also standard, as is the HondaLink system, which also includes emergency crash notification.On the Civic coupe, the blind-spot camera and HondaLink come standard on the Touring trim only. In Edmunds testing, a Civic Touring sedan came to a stop from 60 mph in 117 feet, a few feet shorter than average. Standard on Touring and optional on other Civic sedans is the Honda Sensing safety package, which adds adaptive cruise control, lane-departure warning, lane-departure intervention and forward-collision alert with automatic emergency braking. On the coupe, it's standard on the Touring only. We've found the forward-collision alert to be hypersensitive, however, annoyingly and frequently setting off its "Brake!" alarm in instances where other such systems would not cry wolf. 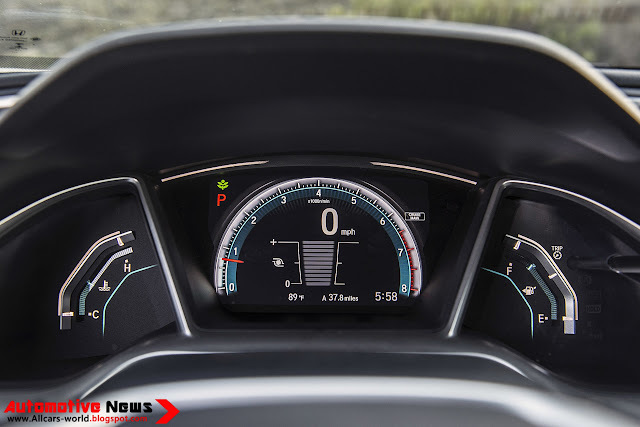 The adaptive cruise control is also too quick to slam on the brakes, too slow to speed back up again and generally not very good at maintaining a constant speed.